Home visits can be arranged by email or telephone. 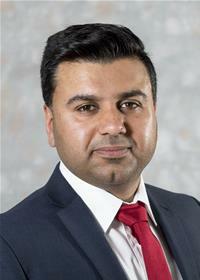 Councillor Toqeer Kataria was first elected in May 2018 for Bevois Ward. Born in Kent, Toqeer’s family moved to Southampton where he was educated in Swaythling Primary School, Cantell Secondary School and Richard Tauntons College. He attended Southampton Solent University and attained B.A. Hns in Business Studies. At present Toqeer is a parent governor at Maytree Infant School, and a Trustee at the Millenium Third Age Centre. Toqeer has a keen interest in Adult Social Care, education and safeguarding.